"We banished from cartography all lions, mermaids, pygmies, and dragons. The sterilization of maps only confirms the disdain we have for nature." When I first met Marcílio França Castro at a coffee shop in Brazil during the winter of 2016, he showed up toting a bag full of presents for me. When he dumped the bag onto the table, out came books, like he was some sort of combination of Jorge Luis Borges and Santa Claus. What most impressed me was his eagerness to promote Brazilian literature in general; several of the books were from his peers and not just ones he had authored. And perhaps Borges is a good comparison for Marcílio; indeed, his writing is in line with the likes of Borges, Calvino, and Cortázar. Yet he does not simply imagine other worlds, he perceives with brilliance unsuspected oddities in places of absolutely no interest. 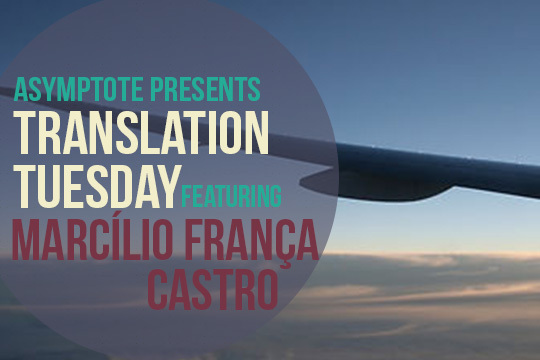 In his short stories, which range from traditional length to flash fiction, and with a prose that is at once economic and yet never lacking in precision, Marcílio França Castro transforms his culture’s most unsuspecting spaces into fantastic reading. The author and I have worked together in producing translations for many of his stories, overcoming differences in idioms, metaphor, sentence structure and other obstacles found in the passage from Portuguese to English. Most importantly, this project kept the translator sane during the subsequent North Dakotan winter of 2017. The manuals say such devices are made to take anything. Bumps, turbulence, high winds, lightning. Even crashes and hurricanes. It’s said they come out unscathed from the most intemperate of weather. You know the protocols. For every inconvenience there is a plan, an automatic fix. An aircraft like this one, with all its resources, ought to be, according to the manuals, practically uncrashable. That’s why, if it were up to manuals and manufacturers, our role would be merely to maintain course and keep her steady, taking advantage of the dignity of flight and the charm of our profession. And that’s really what we do here, before this gorgeous instrument panel, full of buttons and colorful lights: with the prudence it conveys, we relax and commend our fate and everyone else’s to the invisible wisdom of the display. Look ahead. The sky’s magnificent, full of stars; someone might say it’s a painting commissioned to decorate the cockpit. A captain, from the moment of departure, always has his beard well-groomed, his uniform impeccable; he pilots the plane with swan-like indifference. That’s how the passengers see you. We fly calmly. The seats are anatomic and dinner well-balanced. An almost anesthetic experience. The Pacific is nothing more than an enormous tapestry of black silk that clips the horizon. We think and act as if the world outside no longer existed, as though the clouds and the ocean below us were but unfailing radar bleeps or a set of geographical coordinates. In truth, as we fly we simply ignore the substance found in Earth’s elements. Try this coffee, it’s wonderful.